On 8 June Ansaldo STS announced that it has signed a memorandum of understanding with Copenhagen’s metro company, Metroselskabet, to develop a proof of concept for new technology that will automatically adjust train frequency to passenger numbers. The new Dynamic Headway solution will detect congestion through sensors at stations in order to analyse demand. Based on the demand analysis, the number of trains will be optimised automatically, responding dynamically to sudden changes in passenger numbers. The system will be designed using both Ansaldo STS’s train control systems and Hitachi’s digitalisation and Internet of Things technology. Potential advantages of the system being developped include improved service, resolving congestion before it has an impact on passengers and saving energy and operation costs by running trains more efficiently. A protoype solution is planned before the end of the year. If succesfull, it could be fully implemented on Copenhagen’s lines M1/M2 and on the Cityringen project. In the future it could also be included in Ansaldo STS’s CBTC offering for other cities. 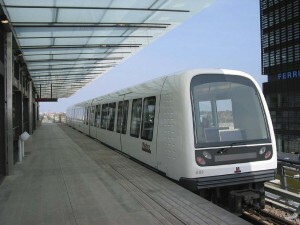 The Copenhagen automated metro system opened in 2002. The network is 21 km long and 22 has stations. Ansaldo STS is a company of the Hitachi Group.